If I had to choose one wedding to photograph on the day before a big move, a move where Eli and I had to drive more than 10 hours to get to our new home, I would choose this wedding over and over again. Sophie and Zach are such a wonderful and laid back people, best friends who couldn’t wait to get married. Their wedding day was just that a day filled with eager excitement to tie the knot and the sweetest couple enjoying the day they had been planning for so long. My favorite part about this wedding was, of course, the details! But honestly Sophie made this day a dream. She is an event planner and you could totally tell. Everything from her colors, to her getting ready pajamas; to the glasses they had mimosas in for toasting. Her perfume bottle even coordinated with her colors. I was seriously giddy when I was taking all the detail photos. She carried a handkerchief that had been in the family since 1912 and it was in a bag with everyone’s name on it that carried it in their wedding. Such a cute something borrowed. Not going to lie, I was a little nervous handling something so precious to her family. Some of the stress free atmosphere was thanks to the wedding planner of this perfect event. 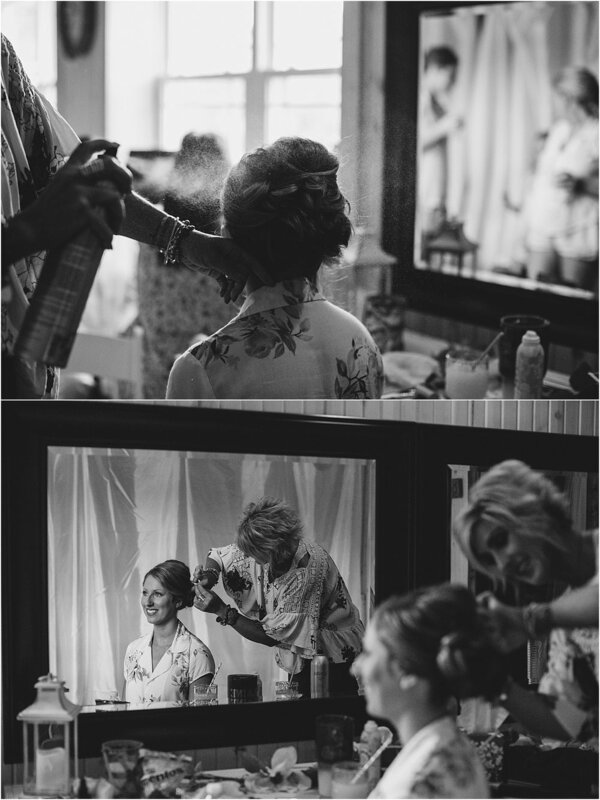 Morgan Banks of Ashley Weddings and Events was truly a-a-mazing! Everything went so smoothly because of her. At one point I saw her helping cut the cake for guests. I couldn’t go without a quick shoutout! A gorgeous venue, a genuinely in love couple, perfect details and a live band to help celebrate, I cannot rant and rave enough about this wedding. His Answer: On the beach at 4-H camp. Her Answer: We met at 4-H camp on the beach I spotted him and a mutual friend introduced us! It is always our tradition to go to West Baden and French Lick during Christmas season to look at the trees and lights. This year we went with friends and Zach proposed in front of the tree in the dome of West Baden. Her Answer: Dinner/Ice cream and taking a drive to the “future homestead” which is where we will eventually build! His Answer: Seeing Sophie in a wedding dress, marrying my best friend and celebrating with friends and family. Her Answer: Tying the knot with my best friend and getting to spend time with our friends and family together. We were friends for 6+ years until Zach had the courage to ask me on a date! What is something unique about your wedding day? His Answer: Our first photo of as Mr. and Mrs. Walking down the aisle. Her Answer: Zach’s reaction to the first time seeing me! Thank you so much for allowing me to witness and be apart of such a beautiful and special day. Congrats Mr. and Mrs. Clark!